It is now a century lacking ten years since the first "Morning Star" sailed from these islands to bring Christianity to the people of the Marquesas and Micronesia. Albert S. Baker has written an interesting account of the "Morning Stars" and of the men who "combined theology with navigation." Those "Morning Stars," all five of them, were on missions of conquest even as we are today. The task of those men was outlined in Honolulu in 1870 at the Hawaiian Evangelical Association, where it was said, as reported by Secretary Clark of the American Board, "Not with powder and balls and swords and cannons, but with the loving word of God and with His spirit do we go forth to conquer the islands for Christ." Today it is our duty to follow the sea-trails of those "Morning Stars," the trails left by those small brigs, barkentines and steamers. Our duty in sailing on a mission of conquest is both fortunate and unfortunate. Fortunate because we know by taking those islands we are liberating a people who again will be able to practice the Christian virtues brought to them by those early missionaries. Unfortunate because we do this work with sword and gun, and swords and guns must bring death for some who go with us on this mission. The days of those "Morning Star" missionaries were hard. They fought their tiny ships through heavy storms and heavy seas  and they had to fight the lassitude of nations governing Micronesian lands to do their work. But on Micronesian islands we have occupied we have seen the enduring evidence of that work. The men who sailed on those "Morning Stars" planted a seed of faith which the years and the cruel strain of Japanese conquest could not wither. We are proud to follow their trails. The story of the "Morning Stars" is a thrilling one. Nothing ever so aroused the interest, enthusiasm, and support of children and young people in foreign missions, and continued it through age. How it came about is briefly as follows. In less than thirty years after the first missionaries landed in Hawaii, the Hawaiians began to feel that as God had done so much for them they should try to tell other groups about Him. As this missionary spirit grew in the Hawaiian churches, as it was bound to do, since there can be no true Christianity without it in view of Christ's spirit and teaching, the Hawaiian Missionary Society was formed, and met, and money became available. This led the missionary fathers to the idea of exploring the islands to the west for the purpose of new mission work in Micronesia in partnership with the American Board. This was done. But the small schooner "Caroline," which it had been necessary to buy to take the first group of missionaries in 1852, was soon sorrowfully sold for lack of money to run her. Other ships only touched the islands now and then by chance and could not be depended on. In 1853 a mission south to the Marquesas Islands had been started, at the request of a chief who had come up in a whaleship to ask for it from the Hawaiians. This at one time covered seven islands. In carrying it on, it had been necessary to charter small and uncomfortable vessels at high prices to take out missionaries with their supplies and to send mail and delegates annually to encourage and look after them. For both missions some arrangement seemed necessary to get proper food to the missionaries, for the transportation of those who became sick, as a protection against the idea that nobody cared what became of them on the part of many evil men occasionally turning up at the islands, and to allow them to go from island to island in the groups to extend their missionary efforts. Conditions grew worse. In Micronesia such a long time elapsed before the first mail arrived after the mission was established, that Mr. Snow's mother had been dead two years before he received the sad news. And at another station there where food was scarce and the variety limited, a missionary came so near starving that when a vessel arrived with supplies, he was so weak that he had to be carried on board the vessel and carefully nursed back to health. In 1856 Dr. Lowell Smith reported on his return from a visit to the Marquesas, "I found our friends all in their usual health, cheerful and happy in their work; but they had been obliged, for several months, to look a little too much on the 'shady side.' Brother Bicknell (an English mechanic) had sold his handsaws, plane irons, chisels, hatchets and adze, and one or two razors in exchange for food. And the native (Hawaiian) missionaries had parted with most of their knives and forks and spoons for the same purpose. They said they would soon have been obliged to part with their clothes if their supplies had not come to hand." If only they had their own missionary packet! The children of England had built the mission ship "John Williams." It was worth considering. Titus Coan proposed that the American Board be asked to invite the children of the United States to take ten cent shares of joint ownership in such a missionary vessel, to be called "Day Star," and he was instructed to write the proposal to Boston. The proposal was favored, with but one change; the name to be "Morning Star." The appeal was made in August, 1856. Actual shares in a vessel going among distant islands on Christian errands speedily became very popular in many states. And in one Hawaiian Sunday School the children took about 300 shares. The money sought, and extra for maintenance, was raised, and the "Morning Star" was built in three months at Chelsea, adjoining Boston. She was a hermaphrodite brig (square-rigged foremast and fore-and-aft mainmast), of only 156 tons. She was launched Nov. 12, 1856, and cost $18,351. Manned and provided, she sailed from Boston on Dec. 2, 1856, under Capt. Samuel G. Moore, with the prayers and wishes of a multitude, and the old song "Waft, waft, ye winds His story." A severe gale soon began, and they were forced to anchor in the lee of Cape Cod, off Provincetown, with a bark one side and a schooner the other. The next morning, after a change of wind, the other two were seen high upon the shore amid the breakers, but the "Morning Star" held fast. After three days a tug towed them around the point of the Cape. Touching at Rio de Janeiro for repairs, she reached Cape Horn Feb. 24, 1857. Snow-capped Mauna Kea was seen April 20, and leaving Hawaii, Maui, and Molokai on their left, they arrived at Honolulu April 24, 1857. This was seven years after the organization of the Hawaiian Society of Foreign Missions, which had sent their own missionaries, in addition to the missionaries sent by the American Board, to the Caroline Islands in 1852, and now were to send them to the Gilbert and Marshall groups also. As the "Morning Star" neared Oahu, they met a small schooner, whose captain, Orramel H. Gulick, shouted "Welcome to the Morning Star." Rev. E. Bond was on board returning from Oahu to Hawaii, and writes, "The long looked for missionary ship was a thing of life and beauty, adorned with nearly her full complement of snow-white sails, and sitting so daintily upon the water. 'Beautiful,' we exclaimed. 'Nani,' said our ninety native passengers, 'nani loa,'  'very beautiful!' and so she was. With unmingled admiration we scanned her elegant proportions, her neatly turned stem, her graceful prow, her modest but significant figurehead, her perfect lines, her tall and beautiful tapering masts." He and Capt. Gulick went on board and warmly welcomed Rev. Hiram Bingham Jr. and his smiling young wife to Hawaii and a missionary life in the Pacific, and took a timely gift of watermelons, coconuts, and sweet and Irish potatoes. Before me is a time-worn "Order of Exercises at the Presentation of a Signal (Flag) to the Morning Star, Honolulu, April 29, 1857." Addresses were made in Hawaiian by Hon. John Ii and in English by Rev. S. C. Damon, songs were sung in both languages, one "The Morning Star" and one "The Missionary Packet," prayer was offered in Hawaiian by Rev. L. Smith, the presentation made by Rev. R. Armstrong, the reply by Capt. Moore, and the benediction by Rev. E. W. Clark, while amid the thousands assembled near the vessel, the new flag was hoisted to the mast-head by Capt. Moore. As the "Star" is pictured sailing past Boston Light with all sails set, she has a pennant or streamer with "Morning Star" on it on the foremast and the national flag at the mainmast. The former is described in Mrs. Warren's book as about twenty feet long and twelve feet wide, of white bunting, with a star directly under the center of the word "Morning Star" and a dove in the lower right hand corner, all of sky blue. Mr. Asa Thurston, son of the pioneer missionary of Kailua, Hawaii, went as first mate on her first trip to the Marquesas Islands, leaving Honolulu just one week after her arrival. She took reinforcements and delegates, after ceremonies attended by a full house at Kawaiahao Church. Titus Coan writes that the "Star" arrived at Hilo on her return July 7, 1857, and remained two days. "Hilo was jubilant. Parents and children came hastening in from all quarters, winding over the hills and along their footpaths and filling our streets .... The children ran and shouted and others 'caught the flying joy.' The joyful event was celebrated by a grand meeting in the church, the foreigners of Hilo joining with the natives in the celebration. Rev. J. S. Emerson, the delegate, brought a cheering report of the beginning of the missionary work by the Hawaiian missionaries in the Marquesas Islands." The people, old and young, brought gifts of fruit and vegetables, fish and flowers, when she sailed. August 7 the "Morning Star" sailed for Micronesia, with Capt. O. H. Gulick as second mate, since (as he himself told the writer) he preferred to be mate of the missionary vessel "Morning Star" rather than to be captain of his own schooner in our islands. He was but 27 at this time, two years married. He became first mate under Capt. John W. Brown in 1859. Capt. Moore only made the one round trip to Micronesia but two to the Marquesas, Capt. John W. Brown replacing him June 30, 1858. Capt. Gulick, second mate, "bears the most unequivocal testimony respecting Capt. Moore's abilities as a commander," and Rev. P. J. Gulick, "who was a passenger to and fro unites in the testimony of his son." At the end of the "Star's" second trip to Micronesia and Capt. Brown's :first trip, he says, "The qualities of the 'Morning Star' have been well tried on this passage, and I think a more able and well-behaved vessel of her class in heavy weather, is not yet built." On her first voyage to Micronesia she had sailed about 10,000 miles, and her practical value for the work had been all that was expected. It was said that the little vessel had already performed a service that would warrant the whole expense of building her. It is interesting to note some of the dangers the little vessel survived on this first voyage. As they always had to use great care in entering or leaving harbor in Micronesia, on this occasion, at one place in Ponape, a boat was sent ahead to tow the vessel out. Finding her progress checked, the captain thought that the tide had turned, and called out, "Pull ahead, boys; pull strong." Just then the mate looked over the side, and thought he saw bottom. Taking the lead with which they were sounding to that side, the captain found, instead of the fifty feet he had been getting on his side, only five feet, the reef being perpendicular and the vessel lying alongside it as at a wharf. A kedge anchor was put out and she was safely hauled away. She had arrived off Kusaie to end in a calm. In the night all hands were called to help work off the vessel from the breakers where she was drifting. They had to work hard for forty-five minutes, with great sweeps thrust out of portholes to use as oars. Then in the morning they found that they had drifted forty miles away, and it took them until the next evening to sail back. This last happened again and again, here and there. At times as many as 150 natives helped haul the "Star" into a lagoon with ropes, and at first the small boats had to search out the channels by which to enter. At one time the rope to a kedge anchor parted when all hands were hauling upon it, but more rope was soon out and the vessel brought safely through. Early in 1860 Capt. Brown's mate was Capt. Gelett, as Titus Coan refers on his trip of that date, to the "mate, Capt. Gelett, a good Christian man, who had commanded many a ship." And Capt. Charles W. Gelett became captain of the "Morning Star" late in May, 1860. On her first visit to Micronesia, leaving Honolulu August 7 and sighting the first island August 26, she had finally left Rev. Hiram Bingham Jr. and wife, he 26 and she 23, as the only American missionaries in the Gilbert Islands, on Dec. 2, 1857, a year to a day from their sailing in her from Boston. This was their station until health required their return to Honolulu just before the last year of the first "Star's" annual trips south and west. In 1866 children and young people were asked to take stock in a new vessel, any excess over the amount needed in addition to the money from the sale of the first "Star," to be used for running expenses and keeping the second "Star" in repair. Twelve thousand dollars was sought, but $30,000 was finally realized; three or four thousand of the 150,000 stockholders being Hawaiians. As to the number of owners of the first "Star," Mrs. Warren, in 1860, dedicates her book to the 200,000 stockholders! The writer found a certificate of stock in the first "Missionary Packet, Morning Star," dated "Missionary House, Boston, 1856," and made out to "Walter A. Preston," in a second-hand book recently bought in Honolulu. It has "American Board of Commissioners for Foreign Missions" across the top, then a picture of the brig "Morning Star" not quite as finally built, as it has only three square sails on the foremast instead of four, and under it "He spake to his disciples that a small ship should wait on him. Mark 3:9." It is signed "James M. Gordon, Treas." A second "Morning Star" certificate of stock for one share, belonging to the writer's mother, is dated June, 1866, bought when she was 21. It has the same form, only a correct picture of the first "Star," and under it "Surely the isles shall wait for me. Is. 60:9." It is signed by "Langdon S. Ward, Treas. A.B.C.F.M." I have seen an elaborate certificate in Hawaiian for money for shares in the second "Star," which may be translated as follows. At upper left is a square for the amount of money; at upper right a square for the number of shares covered; between and below, "Agreement of the Board of the Evangelical Association". Below this is a picture of the first "Star," with "Mk. 3:9" printed in full at the left side of the picture, and "Isa. 60:9" at the right. Under the picture is "of Hawaii," finishing the sentence begun above the picture. It then states, "This is to make known that there has been given by you, (Name), (Amount) for shares of the new Morning Star. Honolulu, July, 1866. E. O. Hall, Treasurer." The third certificate of stock, which was issued in 1870, for what was needed beyond the $18,000 insurance obtained for the second "Star," was probably a duplicate of the second certificate for the following reasons. A certificate for two shares in the fourth "Star" belonging to the writer, dated "Missionary Rooms, Boston, January 1884," is quite elaborate. It has both a picture of the large new "Star" to be, and the second "Star" (the Board being too honest to call it the third, although it was an exact duplicate of the second and so no new picture was necessary), the same kind of a brig as the first only larger, marked 181 tons, and strangely with only four square foremast sails instead of the five of pictures elsewhere. A description of the third makes her also 181 tons, built on the same model, by the same firm, and so, as was said, an exact duplicate. We read of the third "Star" that the expression was often heard, "How like the one that was lost! It almost seems as if she had risen from her watery grave." The certificate of the fourth "Star," as said, is quite elaborate. At the top it has, inside a star with radiating beams, "Share 25c" (no longer ten). Under it is a small picture of a "Star" entering a lagoon; to the right a congregation in church; to the left a picture of the fourth "Star" as a bark of 400 tons (but which turned out to be a barkentine of 430 tons) with all sails set, except the (here) furled five square sails of the mainmast, and black smoke issuing from her hollow mainmast smokestack. The same verse from Isa. 60:9 is around the top of a circle around her, and the name, etc., beneath. Under this picture at the left is the picture mentioned of the second "Star." Below the center picture the name of the "Board" is printed in full, while beneath it we read, "One dime annually from each shareholder will pay the running expenses of the vessel." Below this is the usual form filled in and signed by the same treasurer as the second. I have before me a facsimile of one of these new kind of yearly ten cent shares. It has the "Board's" name in full at the top, with "Shares 10 cents each" under it. Then "This certifies that Ruth Crowell is owner of ten shares in The Children's Morning Star Mission for the year 1898." Under this to the left is "F. H. Wiggin, Treasurer. 1 Somerset Street, Boston," while to the right it reads, "Attest, John Clark Hill," with "To be signed by pastor, superintendent, or teacher," under it. The whole left side of the certificate has a corrected picture of the fourth "Star" placed sideways, with sails only partially set. The next year the form of the yearly certificate was radically changed. The size is about the same, with the same picture, but at the center this time, printed rather faintly in green as background, with "Morning Star No. 4" very small under it. At its right is the very much smaller two-masted schooner "The Hiram Bingham," under all sails with flags flying, and the similar schooner "The Robert W. Logan" at its left. These two schooners were used for interisland missionary service in the Gilbert and Caroline groups. Across the top of this certificate is printed "He spake to his disciples that a small ship should wait on him." Just below at the left is "1899." Under this is "The Micronesian Navy," printed large, and a third line printed small, "Shares 10 cents each." At the right, large, is "The American Board of Commissioners for Foreign Missions," in three lines to balance the left. Across the center and the ships it reads, "Certificate for Five shares in the Micronesian Navy, owned by ______ ______ ______." Under this at the left is "Frank H. Wiggin, Treasurer, Congregational House, Boston." To the right it reads "Attest ______ ______ ______," with "To be signed by Pastor, Superintendent, or Teacher" just below. Across the very bottom runs "The isles shall wait upon me, and on mine arm shall they trust." It has not been possible to find a copy or description of a certificate of ownership in the fifth "Morning Star," a small steamer. 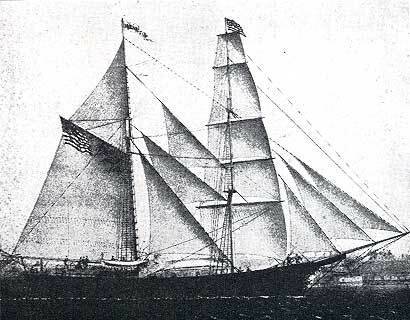 The second "Star," also a hermaphrodite brig, was built at East Boston. She cost $23,406, and was launched Sept. 22, 1866. She sailed from Boston under Capt. Hiram Bingham, Jr., on November 13, 1866. 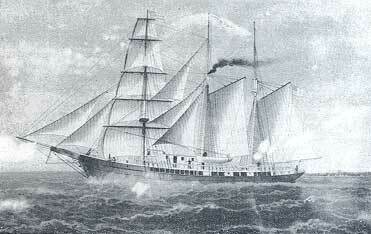 She reached Honolulu March 15, 1867, after only 122 days. We read that "2,000 Hawaiian Sunday School children marched to the wharf to see 'their ship.' " She sailed from Honolulu March 28, 1867, the plan for her yearly trips being that she should go first to the Gilbert Islands to take advantage of prevailing winds and currents, and then 1,000 miles northwest to Ponape, visiting other mission islands on the way, etc. Capt. Bingham thus sums up the first voyage of the second "Morning Star" to Micronesia. "During this cruise of the 'Morning Star' we have visited sixteen different islands, seven of them a second time, two a third time, and one five times. We have carried supplies and mails to twelve missionary families, have had as passengers all the families but one, have had occasion to accommodate at different times nearly one hundred different individuals in all, have found our little vessel none too large for the work to which she has been called. She has proved herself well adapted to the work, and gives good proof of thoroughness on the part of the builders. Long may she be spared to be sent on many similar errands of mercy." Alas, she was spared only three years in all! Much of Micronesia is in the doldrums, that region near the equator subject to calms, squalls, and light baffling winds, as well as strong ocean currents and a torrid sun. Often the "Stars" were in danger or badly delayed as they drifted helplessly about miles from the anchorage. In one "report" to her young owners, the "Star" is made to say, "I came down flying from Ponape  I am going back 'wallowing.' I am doing the very best I can, and am glad no one complains at my slow progress. The only approach to complaint is the natural remark, which rather mortifies me: 'Now is the time for a steamer. O, for the power of steam!' Well, I am sorry, and would gladly do better. I am thinking of the dear ones at Ponape and Ebon, waiting for my return." But it was many years later before even auxiliary steam-power became a reality. Rev. Capt. Bingham's health would not even let him continue here, so in 1868 it was arranged for him to take yearly trips to the Gilbert Islands, where he had formerly labored, to give counsel and assistance, remaining at Honolulu otherwise, engaged in translating the Bible, etc., for these islands. It is stated in the annual report of the Hawaiian Evangelical Association that just the right man had been found to take the "Star" after Capt. Bingham's retirement in 1868, in Capt. Tengstrom. On Oct. 18, 1869, after only three years of service, the "Morning Star" left Kusaie for Honolulu, but in the evening was found to have gotten into a strong current and to have drifted dangerously near the island. Boats were lowered to tow, but she had to be anchored and held, when a severe squall struck her. She tried to sail out of danger, but failed and struck the rocky reef, broadside on, in a heavy surf. The missionaries and all on board, with some of their possessions, were saved in a boat, and, after waiting a month, reached Honolulu on Feb. 8, 1870, in a chance vessel which came along. The wreck was inevitable, and no blame was attached to it. The third "Morning Star" was built at East Boston by the same firm, on the same model, of the same size and rig as the second brig, which she replaced in only three years. They were each 181 tons, practically the size of the "Mayflower" of 1620, which was 180 tons. She cost $28,462. Of course she could not be completed in time for the 1870 visits, but was launched Jan. 26, 1871. She sailed from Boston Feb. 27, 1871, under Capt. Nathaniel Matthews, reaching Honolulu July 3. She left there July 22 and reached Ponape Sept. 13. As Micronesia started foreign missions of its own in 1871, the "Star" went to these other isles, and in 1873 still farther west to the Mortlock Islands, at all of which places the Ponape native missionaries had great success. In the Marquesas Islands it was reported that the devoted Hawaiian missionaries had been obliged to "face persecution and the long, slow pull of mission work in a savage land. They were constantly forced to witness bloody scenes, and to dwell in the midst of horrid vices and crimes. Yet, with patience and persistence unnatural to their race, they held on until at length they won regard and influence. Slowly the system of tabus was broken down, thieving was checked, and their own lives and property were protected even in times of violence." No mission field in the Pacific had been more discouraging, nor any people more dangerous among whom to labor. Secretary Clark of the American Board, who had been present at the jubilee of Christianity at Honolulu in 1870, reported, "The grandest scene of all, that jubilee day, was the veteran native missionary Kauwealoha, returned (probably in the last trip of the second "Star" in 1869) after seventeen years in the Marquesas Islands, where, after the failure of English missionaries and American missionaries (years before), he, with two others, had driven down their stakes and stayed on, through trials and hardships, until he could report four churches of Christ established, and that 500 men and women had learned to read the story of the cross. And there, on that fifteenth of June, standing up in the presence of his king, foreign diplomats, old missionaries, and that great assembly, he held aloft the Hawaiian Bible, saying, 'Not with powder and ball, and swords and cannon, but with this loving word of God, and with his spirit, do we go forth to conquer the islands for Christ.'" The last "Star" which could be found as going to the Marquesas Islands seems to have been under Capt. Matthews, leaving Honolulu March 12, 1872, and reaching Honolulu again in May, 1872. The second "Star" went as usual in 1869, but there was no "Star" for 1870, nor does the third seem to have been able to get there in 1871. Rev. W. P. Alexander was a delegate from the Hawaiian Board on this 1872 voyage, and as a result of his visit he reports, "I think the 'Morning Star' ought to go again next year to take a reinforcement and strengthen the feeble hands and encourage the hearts of the little band that are left. The sending of the 'Morning Star' only once in two years is unwise economy. The taking of supplies to the missionaries is an important service, but by no means the most important .... The annual visit of our missionary vessel is necessary to stimulate the zeal and activity of our missionaries and encourage them in their work. It also increases the regard of the people for our missionaries, showing them that they are so highly esteemed by us that we send our noble vessel every year to help them in their work. If we continue to prosecute our work among the Marquesans, let us do it thoroughly and not by halves; we shall thus do it more economically and speedily." His advice did not seem to have been followed, however. Yet some of the missionaries remained, getting along as best they could, and their descendants are there to this day. After the above voyage in 1872, Capt. William B. Hallett, who had been first mate, took command. In about two months they had sailed again, Mr. Alexander also going along to Micronesia. In August he wrote that they had hoped to reach one of the Marshall Islands that day, "but alas!" said he, "we have doldrums, a puff of wind and a rain squall and a calm. We must have much patience." The next day he wrote, "In the morning at 3:15, we were aroused by the shout, 'Breakers ahead!' Alas! there were breakers on both sides, and soon we grounded .... When day came we found ourselves in a little circular lagoon of Mille (the island sought, but the wrong lagoon), almost one mile in diameter, surrounded by a reef on all sides except the narrow opening where we had entered, and that deep enough to float our vessel only at high tide .... At 6:30 the tide was up, but alas! no wind." The next day "a squall and a lively breeze sprang up, but we dared not raise our anchor lest the strong wind drift us on the rocks .... On Wednesday morning the wind was fair, and we attempted to come out. In the swell we rubbed bottom and rubbed harder. On we went grinding, and at last stuck fast, the swell lifting us up and letting us down crash on the rocks, so that I verily thought the days of our beautiful vessel were numbered, it would be broken up; but with the help of a kedge, we drew off again back into deep water in our prison. For five days we were shut up in this prison, it being impossible to get out except at high tide, and then only with a favorable wind. Running back half a mile, we tacked and made another attempt to escape, and though we rubbed once on the rocks, yet we were successful. Morin, a high chief of Mille, was our pilot. We entered the Mille lagoon (the large lagoon) and anchored near the station of Kehelemauna just at dark." He wrote in favor of the purchase of a steam-launch for the "Morning Star," so as to enter and leave lagoons quickly and safely. "Her great work is in Micronesia, ... in a region of doldrums, whenever she passes to the windward of any of the islands, exposed to be caught in a calm and drifted on to the rocks as her predecessor. perished in Ualau. Most of the islands are so low that in dark nights we might get almost into the breakers before we could see them." But such an idea had to wait over ten years. It can easily be seen how repairs would frequently be necessary on all the vessels, aside from the dry rot so commonly brought about by equatorial waters in the very best of material, especially in the stern timbers. When not too extensive, repairs were made at Honolulu; otherwise at San Francisco. In 1874 Capt. Charles W. Gelett took command again, and in 1875 Capt. A. D. Colcord. In 1878 Capt. Isaiah Bray, who began his sea life with Capt. Matthews, and is described as an experienced navigator and an earnest Christian, took charge. In 1874 Mr. Doane reported as some of the results of 21 years of labor in Micronesia, that "four dialects had been reduced to writing (Gilbert and Marshall Islands and Kusaiean and Ponapean dialects) and into all of them the New Testament, or portions of it, had been translated. 2,500,000 pages of school-books of the Scriptures had been printed. There were three tratning-schools, and twenty churches with a membership of 1,000, giving 45 conversions for each year of labor. These churches had sent forth ten native teachers (as missionaries to other islands), and, in 1874, had contributed nearly $1,000 at the Monthly Concerts." After this churches and membership grew rapidly. Islands let their beloved teachers go after only a year, at the urgent call of heathen islands beyond, and in 1878, when Capt. Isaiah Bray took command of the "Morning Star," she visited 25 islands. In 1880, 448 joined the Micronesian churches, in 1881, 812 joined, and the "Star" had extended her trips to the great Ruk lagoon. On his return from Micronesia on Feb. 15, 1880, after eight months away, Capt. Bray thus reports, "We have sighted 34 different islands during the voyage and visited 26 of them once and 13 of them twice. We have entered 19 lagoons, and dropped anchor 57 times. We have boated 813 miles. We have transferred 251 passengers from one island to another. Upon the whole voyage we have sailed 13,193 miles. Nothing like an accident has occurred during the voyage except the loss of an anchor at Ponape. Twice at Kusaie the vessel dragged her anchor and lay alongside the perpendicular coral wall for a few moments, but not even a scratch to the copper was received. "To the efficiency and alacrity of the officers in their duty both at sea and in port I attribute the rapidity of our movements in Micronesia, and commend them for their interest and care of the vessel at all times, and for their cheerfulness in receiving and executing orders." For the tenth annual trip of this third "Star," reaching Honolulu May 22, 1881, after a little over nine months away, Capt. Bray writes, "The whole distance sailed during the voyage is 15,783 miles, and the number of our passengers 243. The number of islands sighted by the 'Star' is 48, 27 of which we stopped at; some of them several times. We entered 16 lagoons, anchored 43 times, and spent 147 hours standing off and on. We laid at anchor 79 days, and boated 568 miles. We had 1,546 miles of adverse currents, and 989 hours calm." No wonder they longed for steam! The frequent long delays due to the sole use of sails had been a trying and dangerous experience for the missionaries from the very first. One missionary lady wrote of experiencing a thirty days calm in Micronesia. And now the splendidly increasing work at the new islands was too great to give time for the "Star" to return to Honolulu and be back with supplies within a year. In 1883 a compromise was decided upon for a time. A steam-launch was to be provided and ordinarily carried on deck. This was to be used only for towing into lagoons, landing passengers and supplies, and in case of calms or when there was danger of drifting upon the reefs. It was felt that this third "Star" would soon be worn out, and could then be replaced by a larger craft with sails and auxiliary steam. But the launch scheme came too late! On the annual voyage from Honolulu leaving June 22, 1883, having nearly finished her work in all the groups, she was off the harbor of Kusaie on Feb. 22, 1884. She was under the temporary command of Capt. George F. Garland, in the absence of Capt. Bray, with whom he had been mate. Here she was wrecked, only about six miles from where the second "Star" had been wrecked. The wind was not favorable for sailing through the entrance into the harbor, but four buoys were kept there by means of which, with ropes, a vessel could be hauled through to an anchorage. They had made fast to a buoy, but there was a heavy swell that morning, and then the wind began to increase. Suddenly they began to go astern, for the buoy had pulled loose. It was too deep to anchor, for enough chain to hold would have put them on the rocks. They cast off and tried to sail free, but before they could come around they were on the rocks, each wave carrying them farther up the reef. It was all over in less than five minutes, but almost everything on board was saved. After six weeks they decked over one of their boats, and, with two months' provisions, sailed for Ponape. From there Capt. Garland got passage to Hong-kong, and so to the United States, with news of the wreck. Fortunately, some months before this second wreck of a "Star," plans had been made to build another vessel, in regard to which Capt. Bray had gone East. It was to be larger for the growing work and with auxiliary steam-power to guard against the calms and currents prevailing among the islands and the special danger always encountered in entering lagoons. In 1883 Capt. Isaiah Bray of the third "Star" had gone East to present to the Prudential Committee's sub-committee of the American Board on the "Morning Star," drawings for a steamer of a little over 600 tons, as the hearts of friends in Hawaii and the missionaries in Micronesia were fixed on this idea. The Prudential Committee, however, felt that the cost of building and maintaining such a boat was too great. Over twenty years passed before a steamer was acquired, and then it was only two-thirds of the above size desired. Capt. Bray was wanted East, nevertheless, to watch the construction of the vessel that was to be built. In December, 1883, an appeal was made to the children and youth of our country to take stock in a new "Morning Star" at twenty-five cents a share, to the total amount of $45,000. Such was the response that by February, 1884, the Board felt justified in building at once, and the contract was made at Bath, Maine. Thus they began to build the same month that the third "Morning Star" was wrecked. 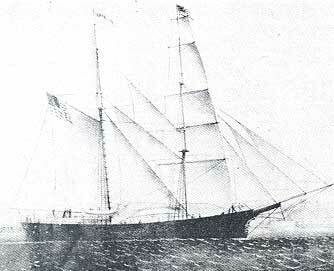 The fourth "Morning Star," of 430 tons, was launched into the Kennebeck River on Aug. 6, 1884. She cost $42,600. The chairman of the Board's committee said that he doubted whether any ship ever had so many owners and of such age and character, even if some of the stockholders were young only in their sympathies and feeling, eleven of them being over one hundred years old. 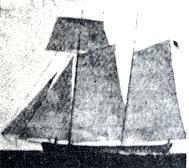 This "Star" was a barkentine (foremast only being square-rigged, main and mizzenmasts fore-and-aft rigs but carrying no topsails so far as pictures show). The first "Star" had been a brig of 156 tons, while this was 430. She had a hollow iron mainmast for a smokestack, for auxiliary steam-power for use in calms and strong currents and in entering lagoons. She had comfortable cabins, staterooms, etc., between the main-deck and a hurricane-deck, and three water-tight compartments below, the center compartment having the engine boilers and coal-bunkers. Upon the substantial hurricane-deck all the working of the ship was done, and it provided a promenade of nearly a hundred feet. The hope was expressed that by the time this splendid fourth "Star" was too old for profitable service, channels of commerce would have been developed so that the work could go on with other regular and far less expensive transportation. The new vessel, fitted and furnished, sailed for Boston late in September. There she was visited at the wharf by thousands of people, including the writer at the age of twelve, the proud possessor of two shares of stock. All were allowed to go all over her, and were delighted with her appearance and arrangements. Religious services were held on board in the presence of a great crowd of friends on deck and wharf on Oct. 27, and on Nov. 5, 1884, she sailed. Capt. Bray of the third "Star" was in command, with Capt. Garland again as his mate. Within twelve hours she was in the midst of a furious gale which drove her for three days under a close-reefed topsail only. At the Straits of Magellan she became a steamer. Rigged for sailing, but with bare masts and showing no visible smoke-stack and no particle of smoke since they were burning hard coal, she moved up to her anchorage at the one settlement in the Straits, Punta Arenas, without even the sound of a whistle. The harbor-master was soon on board and his first words were, "Captain, what are you, anyway? the Phantom Ship?" Taking on fresh supplies, they proceeded out of the Straits into the Pacific on Jan. 23, 1885. Said Capt. Bray, "We were both surprised and delighted to find ourselves through that difficult part of the voyage in less than half the time we had expected." They reached Honolulu March 15, 1885. During the stay there three gatherings took place on board; an entertainment which raised $60 for the Ponape Training School, the regular monthly meeting of the "Cousins' Society," and a meeting of Hawaiians to hear some of the Hawaiian teachers from the Gilbert Islands. She sailed on her first missionary voyage to Micronesia on May 2, 1885, and, with no delay for calms or head winds, reached one of the Gilbert Islands in just three weeks, May 23. She went on through the group to take on teachers and preachers for the Annual Meeting at Kusaie in ten days, instead of the previous sixteen to sixty-two days. Reaching Kusaie June 12, she went on with the usual tour, doing all the necessary work with abundance of time at each island, in half the time required by the old "Star." Dr. Wetmore, Hawaiian Board delegate, reported that on Jan. 26, 1886, "late in the afternoon, we ran upon a small coral reef in Ponape lagoon, where we remained upwards of forty hours. I need not say we heartily rejoiced when we were afloat again, damaged only by a small leakage. The Captain was aloft at the 'look-out' at the time, and I was on the top of the pilot-house; neither of us saw the reef until just before the vessel struck; had we gone only a few feet further to the leeward we would have shunned it and saved much anxiety and toil." Capt. Bray resigned in April, 1886, and Capt. H. N. Turner took command. Criticism having reached Boston in regard to the early repairs needed by the fourth "Star," a return criticism and statement was adopted by the Prudential Committee of the American Board on Feb. 1, 1887, while Capt. Turner was on the third voyage of this "Star." The main points of this answer were as follows: that they felt that complaint of the fourth "Morning Star" came largely because of disappointment that the larger steamer desired by the friends in Hawaii and the missionaries in Micronesia had not been thought possible; that Alpheus Hardy was a man of large experience in shipping and had had charge of building all four "Stars," which were all well-built; that Capt. Bray had watched construction of the fourth "Star" much of the time, and had stated that "wood and iron cannot be put together in a more thorough and substantial manner"; that the builders declared that the best material and labor were used and special care given just because she was for missionary service, and that she was well ventilated and the timber and planking well salted; and finally, that any trouble therefore must be due to the "trying character of the region in which she sails, or to some neglect in her care." Capt. H. N. Turner, returning to Honolulu on April 4, 1887, reported: "Number of stations stopped at, 46; number of Islands visited, 23; number of miles sailed and steamed, 13,846; number of miles of boating, 748. The engineer reports fifty-five days and five hours of steaming during the voyage." Next, in 1887, Capt. George F. Garland, mate from Capt. Bray's time in the third "Star," took command, and continued throughout the career of this "Star" and on through the fifth and last "Star," being connected with the "Stars" for over twenty years. At the conclusion of this long service, Capt. Garland and his wife, who had been a missionary in Micronesia, were asked to take charge of the "Missionary Home" at Oberlin, Ohio. It was during this period that trouble began through the establishment of foreign sovereignty in Micronesia by European nations. Fortunately, foundations had been more or less firmly laid by this time, however, and mission work was progressing. Spain took the Caroline Islands and Germany the Marshall Islands in 1887, while the British took the Gilbert Islands in 1892. The greatest trouble and persecution occurred in the Carolines, much less in the Marshalls, and very much less in the Gilbert group. In the same way the French had caused considerable trouble in the Marquesas Islands at the very first beginning of mission work there in 1853, as well as at later times. The worst outbreaks and destruction of property by the Spanish were in 1887 and 1890, and this was followed by a destructive tornado in 1891. For some time the Spanish forbade missionaries or the "Morning Star" to visit certain islands. More ease came after the Spanish-American War, however, for then Spain sold the Carolines to Germany, who took possession in 1899, and proved friendly for a time. But in the Marshall Islands, the Germans forbade the missionaries to work on any new island, and the "Morning Star" was required to pay $250 annually for a license to sell Bibles and other books and articles needed by the churches. But in spite of the serious retardation of mission work by the usurpations of European nations, the churches generally held their own, and on some of the islands even made great progress. From the beginning of work to this time of the fourth "Star," many thousands of natives had been received into the churches, with thousands still members of churches on many islands, and several training-schools, girls' boarding schools, and common schools established. It is interesting to note that at one time thirty per cent of the Hawaiian pastors are reported to have become missionaries at different ones of the foreign island groups. The people of Hawaii gave liberally to this work of the "Hawaiian Society for Foreign Missions," the Hilo church being especially generous. After 1863 this "Society" was merged into the new Hawaiian Board, which continued this foreign work some forty years. A list of all American and Hawaiian missionaries to Micronesia and the Marquesas Islands may be found in the last "Cousins' Society" "Missionary Album," published in 1937. The fourth "Morning Star" included San Francisco in her schedule, as well as Honolulu, although spending eight months of each year in touring among the islands. During these tours missionaries visited different stations, preaching and encouraging native workers, organizing churches, receiving new members, starting schools, etc. In July, 1891, we learn that the "Star" went to San Francisco for extensive repairs and new boilers, frequent small repairs being made at Honolulu. On the 1894-5 tour we read, "The only mishap of the voyage occurred at one of the Marshall Islands, where the 'Star' ran her bow on the reef and remained there four hours till floated off by the tide." In 1897 she again had extensive repairs at San Francisco. In 1898 she was nearly a year at San Francisco because of the war with Spain. This "Star" served long and well until 1900, when she was sold for the "carrying trade" between San Francisco and Cape Nome, Alaska, as otherwise such heavy repairs would have been required. There now followed a break until 1904, when the fifth "Morning Star" was obtained. It had become increasingly evident that no commercial lines were yet sufficient for the work. It was felt that the efficiency of the mission stations and the comfort and very life itself of the workers was dependent on stated and regular visits of missionaries and the missionary ship. It was again hoped in the Pacific that swift and ample steamer accommodations would be recognized as a necessity and provided. Alas, for what did materialize, as we shall see! The Hawaiian Board closed this particular foreign work with 1903, as its 1904 report shows, and left its continuance wholly to the American Board, although it left three people still working there in 1904. Conditions had changed in Hawaii, and it now also had much "foreign mission" work at home. Since the Hawaiian Board no longer shared in this particular mission work, it was very difficult to find details of the fifth "Morning Star" in Honolulu. A call on Miss Bray at Kaimuki, daughter of Capt. Bray of the third and fourth "Stars," resulted in the advice to write to Capt. Garland of the fourth and fifth "Stars," whose address she gave at Oberlin, Ohio. Capt. Garland promptly replied that he now had no journal or "log-book," and that "to tell the honest truth" his "memory machinery was sadly out of order," at 89 in March, 1942. He said that he would like to help in this matter, and would think about it and try to remember and perhaps could jot down a few notes. Two months passed, when, after hopes had been abandoned, a vivid account of his taking out the fifth "Star" to Micronesia via the Suez Canal, a hurricane at Kusaie, and the consequent necessary voyage on to Honolulu, with details not given elsewhere, and written especially for this article, was received. Soon after, following considerable futile correspondence with Boston, through the kindness of Dr. Enoch F. Bell, editor of "The Missionary Herald" and Historian of the American Board, came copies of items in the old "Missionary Heralds," in American Board reports, and in its "Prudential Committee Minutes," dealing with this "Star." Our troubles were now at an end! Between the sale of the fourth "Star" in 1900 and the fifth "Morning Star" of 1904, other vessels were employed to tour the island groups, but all were unsatisfactory and considered only temporary. It is interesting to note that while the fourth "Star" was still active, a schooner of about fifty tons, the "Robert W. Logan," was in use for local work for the western section of the Caroline Islands, and a gasoline launch, the "Hiram Bingham," was touring for most of the time among the Gilbert Islands. The former was lost in three years, but the latter long continued its usefulness. Early in 1904 it was decided to build a vessel of wood, not to exceed 300 tons, a barkentine as before, with auxiliary power again, to remain in Micronesian waters, as supplies could now be forwarded by regular commercial lines from Hong Kong and Sydney to several points in the Caroline and Marshall groups. This vessel could make Kusaie or Ponape its home port, it was declared, and easily make two trips a year through the several groups instead of one. The need for frequent repairs in those waters seems to have been overlooked. It was stated that hesitation to build before was not due to not understanding the need, but to doubt as to provision for the cost. Remembering, however, that the children of the United States had built four vessels, contributing in all to this work $114,593.33, it was believed that they would again respond, as did their predecessors. From the sale of the last "Star" and other sources the Board had in hand $18,000 which could be used for this purpose, and it was thought that another $20,000 would build it. Certificates in two colors for shares in the new vessel were engraved, and the appeal made for subscriptions, this time at ten cents a share again. It was stated that it would be better to get 200,000 young people directly interested in missionary work, rather than just to raise $20,000 in larger sums. A little later in the year a statement was issued that it was impossible to say at present just what arrangements would be made as to the vessel itself, as a search was being carried on in the hope of finding some craft already built. Shortly thereafter it was stated that a little steamer named the "Sunbeam" could be purchased on favorable terms, which was just such as the missionaries in Micronesia had long been asking for. She was described as "about four years old, of wood, coppered, well-built and thoroughly furnished." Her length was 140 feet, over all, and thirty feet beam; her draft was nine and a half feet, and her tonnage 403. She was smaller than the fourth "Star" of 430 tons, or the steamer "Mikahala" of 444 tons, which many readers will remember in Hawaii. She had two masts, fitted with sails, for aid when winds favored, and she could readily steam ten or eleven knots an hour. A sub-committee of the "Prudential Committee" on "Missionary Vessels" was authorized to purchase the steamer, said to be "now at Norwich, Connecticut," and it was arranged to change the name to "Morning Star." Preceding this purchase by a committee of the Board, we find that other attempts had been made. Capt. Garland writes, "The Board decided to have a small Steamer for their Mission work in Micronesia, and I was sent over to Liverpool to try and find a suitable craft for their work, but I could find nothing in size or price that was suitable." Presumably he had tried the American coast first, although he does not say so. He continues, "After I returned to Boston, a small steamer was found in Stonington, Conn., which the Board purchased, and with some alterations she was considered suitable for their work. I went to Stonington and brought her to Boston where the needed repairs and changes were made and her name changed from Sunbeam to Morning Star." She cost $30,000, with an additional $7,000 to repair and adapt her for her work. This large sum, in addition to her entire unsuitability in the eyes of seafaring men, led to much criticism. The writer was in New England this first half of 1904, and well remembers hearing the criticism that the Board had sent a committee of sky-pilots to purchase a craft to cruise the oceans of earth. It is very doubtful whether any minister of this century ever combined navigation with theology as did Rev. Capt. Gulick, Rev. Capt. Bingham, etc., of the middle of the last century. The committee was by no means all ministers, however, even if they were probably far more missionary-minded than nautical. The sale of shares proceeded very slowly. Even after the "Star" had reached Ponape in the Caroline Islands in October, less than $10,000 could be reported instead of the $20,000 first requested, now increased by another $5,000. As the other four "Stars" had been over-subscribed, surprise and disappointment were expressed. The writer thinks that as there was a rest in the campaigns after each vessel was built until the fourth, the new yearly selling of ten cent shares in "The Children's Morning Star Mission" for running expenses, may have tired people of this method for mission work. Anyway, steam had brought the islands nearer and they were better known, even if many of them were still romantically isolated. And then so many new interests had come into being! But worst of all would be to own shares in a tiny second-hand steamer. This fifth and last "Morning Star," after being inspected at Boston by many shareholders, was dedicated and farewell services held on board on June 4, 1904. Dr. Hiram Bingham, who had sailed to Micronesia on the first "Morning Star" in 1856, and whose father, Hiram Bingham, Sr., had then been present and prayed at the time of departure, was now present and offered the prayer of dedication. Capt. George F. Garland writes, "We sailed June 11, 1904, for the Pacific Islands. I remember we had to coal up several times on the voyage. ("The Missionary Herald" for that July states that the "Star" would probably coal at Fayal, Malta, Port Said, Aden, Colombo, Singapore, and possibly some port in the Philippines.) We of course passed through the Straits of Gibraltar and crossed the Mediterranean to reach the Suez Canal. From Aden, we had hoped to go right on to the end of the trip without any delay from bad weather, but upon leaving Aden we found the sea and weather so rough from the blowing of the strong monsoon that we felt it wise and best to turn back to Aden and wait for it to blow out before crossing the Indian ocean. We therefore waited at anchor in Aden over a month, at times getting reports from large steamers which arrived from the East, as to weather conditions. Then we went on our way without serious trouble, reaching Ponape in the Caroline Islands Oct. 27, 1904, missionaries and natives as well as all on board rejoicing over the safe arrival of our little craft." She immediately toured Micronesia, as was usual; going from Ponape, her home port, first to Ruk (Truk) and the Mortlocks, then to the Marshall Islands and Nauru, and last to the Gilbert Islands. She was most satisfactory on that trip, but now, in April, 1905, came a hurricane at Kusaie. "One morning," continues Capt. Garland, "while at anchor in Lee Harbor (Kusaie) I noticed the barometer falling very fast, though the weather was fine at that hour (3 A.M.). I immediately called 'all hands on deck' and prepared the ship for a 'breeze' which soon struck us strong. Although both anchors were down, away we went dragging them after us across the harbor until we struck a coral reef and could go no further. By the action of the barometer and the strong wind I knew we were in the direct path of the hurricane. Proof of this soon came when the wind suddenly dropped to a calm and in a few minutes came out strong from the opposite direction. That is, from about North East to South West, and away we went across the harbor again and over the place of our early morning anchorage, and stuck on a sandbar, dragging our anchors as before. "The wind soon began to drop and was normal again, but the ship was still on the sandbank. As soon as the tide came in, we were able to haul her off into deep water again. A native diver went down and reported some of the copper sheathing was torn off, but no serious damage. His report proved correct. The smallness of the harbor was what saved the ship, for even the hurricane wind did not make up a heavy enough sea to damage the ship while on the reef. "The reason we got no help from the engine during the blow was because the engineers had the engine undergoing repairs, none of us expecting trouble in such an ordinarily quiet harbor. I don't think any of us on board fully realized the strength of the wind while being driven across the harbor, until we happened to look ashore and saw great trees being broken off or uprooted." Although there appeared to be no serious damage done to the "Star" by the hurricane, it was thought best to go on to Honolulu for repairs, after she had finally completed her trip through the islands, where she arrived in July, 1905. The writer saw her at anchor in the harbor there in October. It is stated that to the surprise and disappointment of all concerned, both at Boston and in the Pacific, her usefulness was negated by the tremendous expense of running her. She did not have the space to carry enough coal to last for a round trip among the island groups from either Honolulu or Sydney, even if it had not been purposed to keep her at the islands. Coal for her use freighted to Micronesia made it an exorbitant price. 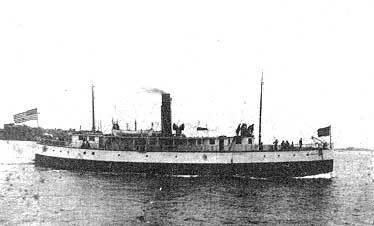 Meanwhile steamship lines had finally been established to give regular communication every three months to the principal Marshall and Caroline islands, and other vessels passed to and fro among the groups which could be chartered for limited periods of a month or six weeks to be used by the missionaries, or, in certain cases, they could use their own smaller craft. In view of all these facts, on Oct. 24, 1905, the "Prudential Committee" voted to authorize the "Finance Committee" to proceed with the sale of this last "Morning Star." But even this encountered great difficulty. Capt. Garland continues, "The Board soon decided to give up the use of a steamer, and I was to take the Star to the Coast. She was for sale. Soon after leaving Honolulu, the Engineer discovered some trouble with the engine and thought it wise or best to return immediately to Honolulu, so we turned about and retraced our course to Honolulu. I then left the Star, and another man was appointed in my place. He took her to the Coast when she was ready to go. I do not remember the Captain's name, nor how long it took to make the trip." The "Star" was finally taken to the Coast and sold in 1908, although it was not officially voted to authorize the signing of the bill of sale to Hind, Rolph and Co., Inc., until Jan. 19, 1909. In 1910 she was seen in service between various ports in Puget Sound. Thus ended a half century of missionary "Stars," 1856 to 1905. It does not seem possible that mission work in the Marquesas Islands and Micronesia could have survived without them. These "Morning Stars" have passed, but the influence of their service continues, not only in those distant islands but throughout the United States and Hawaii, where many a person today says proudly, as a result of lifelong missionary interest and enthusiasm, "I owned shares in a 'Morning Star.'" The "Stars" have passed, but the work goes on to this day, although we know nothing about it since the war. Articles by Willard Price, well illustrated and with unusually full maps, in "The Saturday Evening Post" of April 25, 1942, and in "The National Geographic Magazine" for June, 1942, give an excellent idea of Micronesia. The latter magazine mentions our A.B.C.F.M. work, with pictures of a native Christian minister of Truk and of the Baldwin sisters, who at that time had worked for forty years on Kusaie and 'Were both over seventy years of age. Some of us had the pleasure of meeting the younger sister on her return home in March, 1941, then over eighty. The older sister, who continued her work though blind, had died. The results of their work will endure. 2. Brig 181 23,406 1866 Hiram Bingham, Jr. Probably others as well as the writer have wondered about the picture, hanging with the pictures of the "Morning Stars" at the Chamberlain House, of the queer-looking straight-lined schooner, with regular schooner jibs and fore and mainsails and an unusual square foretopmast sail, for she does not seem to be mentioned in the usual histories of early missionary days here. Another reason for writing this article is the fact that she is in a group of six of an old cut, including four "Morning Stars," which was reproduced in "The Missionary Herald" for March, 1942, where she has part of her right name, but is wrongly described as "The 'packet' that first carried the missionaries from Boston to the Sandwich Islands." The same thing appears in "The Story of the American Board" by Dr. William E. Strong, published in 1910, for which the cut was probably originally made. Its only connection with the brig "Thaddeus," however, on which the missionaries first came from Boston in 1820, was that its mate, James Hunnewell, captained her out from Boston in 1826. No missionaries came on her. In this picture she is also drawn on a scale to make her look almost as large as the "Stars," of from 156 to 430 tons; whereas she was less than 40 tons. The "Thaddeus" was 241 tons, instead of 40. Finally, this small craft was used by the missionaries here to start a brief mission in the Marquesas Islands twenty-five years before the first "Morning Star" began her yearly visits there, as will appear farther along in this account. Apparently the missionaries did not ask for her, except perhaps indirectly, through writing of their long uncomfortable voyages on crowded little schooners, often going only at inconvenient times between the islands. Perhaps this is why she is so seldom or never mentioned in missionary records, coupled with the fact that she was a sort of "white elephant" on their hands due to the expense of upkeep and running her. Possibly they also felt that the cost of building and getting her to Hawaii, much more even than the American Board anticipated, $6,426.36, could have been much more profitably used by the Mission. However this may be, Rev. William Ellis, the well-known English missionary, as he was returning from Hawaii to England because of the health of his wife, suggested it to the American Board at Boston, and they decided to build and send out a small schooner for the use of the missionaries between their island stations. This schooner was built at Salem, Mass., in 1825, and was 54 ft. long, 13 ft. wide, a bit over 6 ft. deep, and of only 39 tons. Naturally she had only one deck, but she had two masts, no figurehead, and a square stern. She could not have been much improvement for comfort over the ordinary schooners, for it does not seem possible that they could have been smaller, although Thrum's "Annual" of 1878 gives the size of inter-island schooners wrecked as late as 1876 and 1877, as between 33 and 50 tons; a similar size even fifty years later. Probably the Board had no real conception of the distances or the roughness of the islands' channels even from the letters, or they would have built larger or not at all. This queer-looking craft had an equally queer name, just the word "Missionary" before "Packet," the term to designate her use, so she was nicknamed in the islands another queer name, the "Ten Commandments," and was thus commonly known, as a "Friend" of 75 years ago informs us. She also had an equally queer history throughout her lifetime. James Hunnewell of Charlestown, Mass., who had been mate of the "Thaddeus," agreed to captain her out with no charge for his services, if he be allowed to take forty barrels of merchandise with which to start business in Honolulu. According to Twombly's "Hawaii and Its People," he became the first merchant really to settle in Honolulu. This early business of 1826 developed into the present important firm of C. Brewer & Co. Hunnewell transferred the business to others in five years' time and returned to business in Boston, although continuing to have large dealings with it for thirty years. The "Missionary Packet" sailed from Boston on Jan. 18, 1826, reaching Honolulu on Oct. 21, 1826, or in 276 days. Hunnewell thought it a record for length of time, eleven of the twelve companies of missionaries to Hawaii taking from 116 to 188 days, while the other company corning via Tahiti took only 244 days. The reason for this length of voyage was due to the delay of some two months beyond the time promised for the completion of the schooner, thus making the start from Boston too late in the season both above and below the equator, coupled with what proved to be her wretched building. Capt. Hunnewell wrote that it was through "an unpardonable want of prudence, or want of feeling" on the part of the builder. On sailing, when loaded, her deck proved to be but one foot above the water-line. Her log shows that they were obliged to "lie to" for many days in heavy weather, even with fair winds, as the seas filled the deck full, endangering the vessel. She also strained and leaked so much that there was very frequent pumping, and men and materials above and below were wet and the men extremely uncomfortable and worried. They had not meant to stop at Rio, but went in for repairs, taking two weeks. However, she strained again and they had constant trouble. Unable to round Cape Horn because of storms and currents, they finally gave it up and made for the Falkland Islands, remaining six weeks in company with other vessels, in two different harbors. Then they decided to try the Straits of Magellan. They got through in 36 days, anchoring at eighteen places for one or more nights. Otherwise they only stopped for one night at Valparaiso and one at Lahaina. The best day's run of the "Packet" in the Pacific Ocean was 169 miles. The captain had started with only two inefficient Americans and two always faithful Hawaiians, although he took on a cook at Rio and an extra man from another vessel at the Falklands, both of whom left at Valparaiso. After the "Missionary Packet" arrived in the islands, the burden of her care and expense was so great to the Mission, that, even the very next year, 1827, its business agent, Levi Chamberlain, chartered her, when not in mission use, to Hunnewell and another merchant, Stephen Reynolds, to freight sandalwood from various islands. And in February, 1828, he chartered her to still another merchant, William French, for inter-island service for one year, at $100 a month and $4,000 if she was lost during that time, provided that he carry mission supplies free of charge and on due notice let the Mission have her for any necessary service at their risk and charge. Soon after the end of that year's contract Chamberlain wrote a note to the effect that, taking all things into account, it was as great a disadvantage to own the "Missionary Packet" as to have no vessel at all, and signed an agreement on April 4, 1829, to sell her to Princess Nahienaena, who signed the agreement as Halieta Keopuolani, with six chiefs signing with her, including the king, Kauikeaouli, and the Kuhina Nui, Elisabeta Kaahumanu. The agreement provided that the Mission was to have her three months of every year, free of charge, for twenty years, when it would cease to have any rights in her. If she should be lost before the end of twenty years, the chiefs were to provide some other vessel for the use of the Mission. She was turned over to the Princess at Lahaina on May 15, 1829, who also chartered her to local businessmen occasionally. In 1832 the missionaries used her on a voyage to the Marquesas and Society Islands. Whitney, Tinker, and Alexander went from Honolulu July 18, reaching the Society Islands August 22 to consult with English missionaries as to a possible Marquesas mission, and leaving Sept. 18, visited the Marquesas Islands on Oct. 20 for a week. They reached Honolulu Nov. 17, 1832, via Kaawaloa and Lahaina. The next year a mission was started, but had to be abandoned in less than one year, until twenty years later. A letter of Mr. Chamberlain's dated Jan. 4, 1834, states that they had found it necessary to take back the "Packet" as the agreement was not being kept as to repairs and free use by the Mission for a quarter of each year. He said that she was returned "very cheerfully," although with regret. This was on Dec. 2, 1833, and Jan. 1, 1834, she was chartered for ten years to Brinsmade, Ladd and Hooper, to be put in repair by the Mission and kept so and insured by the firm, with free transportation of mission supplies on their regular inter-island trips and two months free use of her annually and at other times, if necessary, after due notice and paying that part of her expense when so used. The firm was to use her on one foreign voyage of three or four months and the Mission one to the Marquesas Islands if desired. Almost at once, Jan. 10, 1834, her charterers sent her through the South Pacific, visiting Tahiti and Valparaiso, and not reaching Honolulu again until July 15. In July, 1835, she was again sent to the Society Islands on business for both parties, the Mission and Ladd & Co., as they were now called. She was away only 68 days, with a couple of weeks there. Near the end of 1836 she was found to be in such bad condition that a regular survey was made by competent people who reported that to be seaworthy she must be wholly rebuilt. Ladd & Co. considered this a condemnation of the vessel, which let them out of their agreement, so turned her back in only three years instead of ten! The Mission could not rebuild and asked Ladd & Co. to break her up for them and sell for what they could get. Before this could be done, Zacheus Rogers, a ship-carpenter of Honolulu, bought her on Jan. 23, 1837, for $1000. He is said to have taken his own time in rebuilding and repairing her, putting her in order for sea, and offering her for sale. Thus ends her entire connection with the Mission, the whole bane since her original arrival at Honolulu being only ten years and three months. We will now trace her later history briefly. 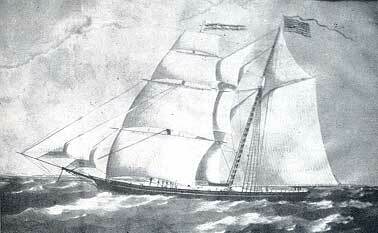 Some months later, in 1837, she is referred to as the schooner "Oahu Packet," Z. Rogers, captain. On June 17 she is reported as sailing under him on a sealing voyage, from which she returned on September 3, 1837, as the Sandwich Island schooner "Honolulu." Levi Chamberlain's journal, under date of November 23, 1837, notes, "Today the Schr. Honolulu, formerly Missionary Packet, which has been purchased by Mr. Dudoit (French Consul), sailed from this port for Ascension (Ponape) and carries Mr. Bachelot and Maigret, French Catholics." These Catholic missionaries were being forced by the chiefs to leave Hawaii for a second time, and had agreed to buy the schooner from Mr. Dudoit for $1,000 down and $29000 within a month after the end of a voyage already arranged to the western part of the Pacific and then to Valparaiso. These missionaries gave the schooner one more name, "Notre Dame de Paix," and Father Maigret boarded her Nov. 17 and later Father Bachelot, and they sailed on Nov. 23, 1837, as stated. Father Bachelot was ill on sailing and died Dec. 5, being buried on the little island of Na close to Ponape of the Caroline Islands on Dec. 13, where Father Maigret waited six months until the schooner, finishing her voyage to the west, returned July 2, 1838. They sailed July 29, reaching Mangareva in the Gambier Islands, headquarters of Catholic Missions in eastern Oceania, on Nov. 10, 1838, and Valparaiso on Dec. 22. The $2,000 was paid Jan. 1, 1839, and leaving on Jan. 27, she returned Father Maigret to Mangareva on March 15. She was probably wrecked on some South Pacific island early in 1840, for Hunnewell published an account of the "Packet" where he says she was owned by the French Roman Catholic bishop of eastern Oceania, "who fitted her out (at Mangareva), and sent some of his own people on a mission to the islands in the South Pacific Ocean, where (as I understand) she was totally lost on her first voyage under (these) new owners." Thus concludes her strange history of some fifteen years. Born an American Protestant, she died a French Catholic; all this being but very little over a hundred years ago.